Birth isn’t one of the major life cycles at the center of Thornton Wilder’s Pulitzer Prize-winning classic Our Town. Of course, someone is born during the play -- and the result is the heartbreaking ending that has flooded audience seating areas with tears since the classic play premiered in 1938. Happy tears are likely to result from Miami New Drama’s birthing of a brand-new, compelling vision for Wilder’s play. This has resulted in a bold, tri-lingual production with English subtitles and a diverse, multi-ethnic cast. The revision had its world premiere performance recently at Miami Beach’s Colony Theatre, ahead of its official opening. The play runs through Nov. 19. The production has been more than a year in the making and is worthy of celebration for the daring, relatively new, Miami Beach theater company. The non-profit company celebrates the Miami area’s diversity through its engaging, timely, thought-provoking work. Speaking of celebrating, artistic director Michel Hausmann’s approach works particularly well, especially at the end of Act II. In a traditional production, there’s a 10-minute intermission between Acts II and III. Technically, that’s also the case in this production. 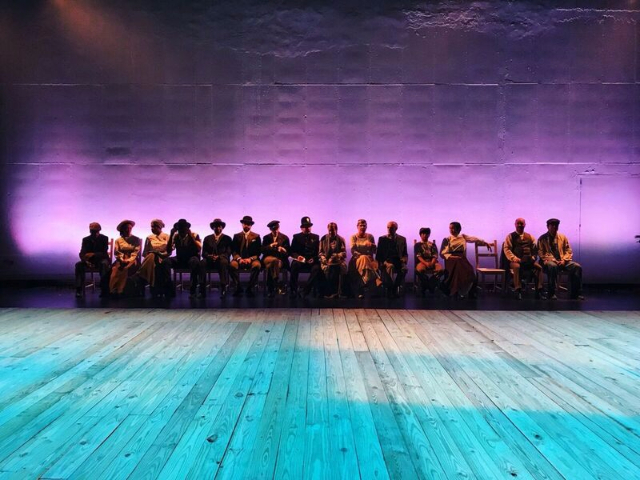 Somehow, though, you get the sense that the play continues without an interval and doesn’t end until the final “curtain.” During the “break,” we’re all invited up to the stage to dance, sing and be merry with the cast in celebration of Emily and George’s just-concluded wedding. The setting is still technically Grover’s Corners, N.H., but this production is also a celebration of our town in 2017. That town, or rather city, is the melting pot that is Miami and environs, with all its diversity. Representatives of the Wilder Estate have made it clear they welcomed Miami New Drama’s approach. Wilder “conceived Our Town as (a) universal play about everyone in communities everywhere and thus a piece of world drama,” A. Tappan Wilder, Thornton’s nephew, wrote in the program. Audience members are (if they wish to be) participants in the production. During the preview performance, several audience members rose from their seats and ascended the stage to sing and dance to songs such as “La Bamba.” Audience members living in 2017 co-exist with turn-of-the-century characters. Meanwhile, in Brechtian fashion, the character of the “Stage Manager” at one point enters from the audience and interacts with patrons. This further sets this production not just in turn-of-the-century Grover’s Corners, but Miami in 2017. As the playwright’s nephew essentially wrote, we’re all part of the world Wilder depicted in Our Town. This production adds new layers to what it means to celebrate the “small,” seemingly “mundane” aspects of existence on earth. The play, as many know, posits that people don’t fully live and appreciate every moment of their existence, especially the “ordinary” ones. We don’t take the time to really look each other in the eye as we speak. We don’t relish the simple, yet precious things such as food, coffee and even sleeping and waking up. Only a dead person, if he or she could, would understand what it means truly to appreciate the fragility and fleeting nature of life, Wilder seems to say. The production extends this premise to emphasize the importance of valuing diversity. It’s a welcome approach during a time when tensions are running high over issues such as immigration and charges of racism are airing with frequency. Despite the different approach, Hausmann and Co. leave Wilder’s script intact, as well as the traditionally minimalist scenery; the set is comprised of tables, chairs and little else. There are no props; actors mime all actions. The minimalism helps emphasize the universality of the play and takes our attention away from material objects. We’re forced to look at the characters of the play and carefully consider the themes in Our Town. 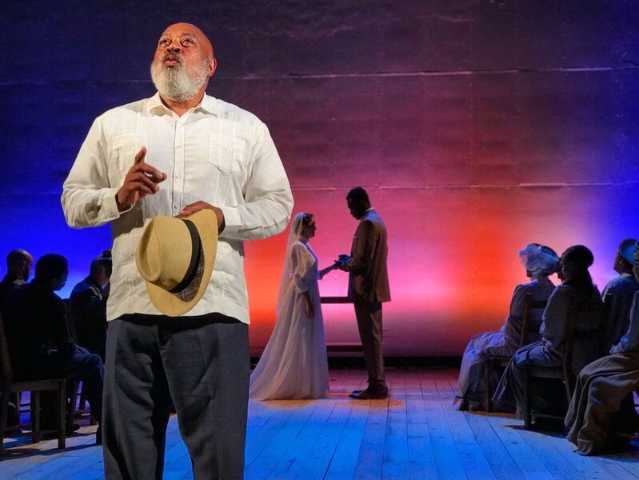 You’ll recognize all the characters and Wilder’s simple, poetic, hauntingly beautiful text -- parts of which have been translated into Spanish and Creole by playwrights Nilo Cruz and Jeff Augustin. A trap in staging Our Town has always been making the play seem like a sentimental, nostalgic piece about an idealistic, bygone era in Small Town U.S.A. Fortunately, director Hausmann avoids falling into that, avoiding a “stop and smell the roses” approach. The pacing is varied; as the characters go about daily lives, there’s a sense of them rushing through their existence. They’re not realizing “life while they live it…every, every minute,” in Emily’s words. There’s a marked contrast when the Stage Manager (Keith Randolph Smith) slows the proceedings down to tell us something. As wonderfully played by Smith, even the Stage Manager has an impatience that’s evident, for example, when he rushes a professor as she tries to talk about the facts and history of Grover’s Corners. What’s the rush? Time is short, the Stage Manager answers. His response is not only a reflection of the characters’ tendency to hurry; it foreshadows the tragic ending. Smith gives us an unsentimental, nuanced stage manager. The Broadway actor knows which words to emphasize to create the desired effect. “The day’s winding down like a tired clock,” he tells us, emphasizing the last two words in a tone designed to make us feel uncomfortably aware of our mortality. Toward the end of the first act, the Stage Manager dismisses us for intermission. Smith’s Stage Manager emphasizes the last three words in an almost rebuking manner. The subtext: Smoking can shorten an already all-too brief time on earth. Smith endows the character with an unflinching honesty. There’s enough seriousness in his voice to awaken us to life’s fragility without depressing or outright frightening us. The character’s solemnity is leavened with moments of light-heartedness and humor. Thallis Santesteban, as Emily, also shines as a highly emotional young woman lacking self-esteem. The actress convincingly imparts big emotions without overacting. Her expressive eyebrows and voice convey a vulnerable woman who is starved for love and acceptance, easily irritated, yet likable and fragile. Her intense yearning to return to life for a day and her subsequent heartache will break your own heart. Santesteban’s Emily breaks down convincingly at the end while delivering the play’s famous passage about life’s simple, often-overlooked pleasures. Along with a generally strong cast, kudos must also go to lighting designer David Lander. Darkness blackens the upstage area, where actors sit in a straight row of chairs when they’re not acting. The bleakness helps to foreshadow the tragic third act. Primarily, Lander bathes the stage predominantly in a light blue, creating an otherworldly effect that also conveys a sense of melancholy, hinting at the heartbreak to come. At the same time, the color imparts a sense of quiet contemplation and serenity. Parts of Our Town are unsettling, but this play also has the power to calm -- and unite. 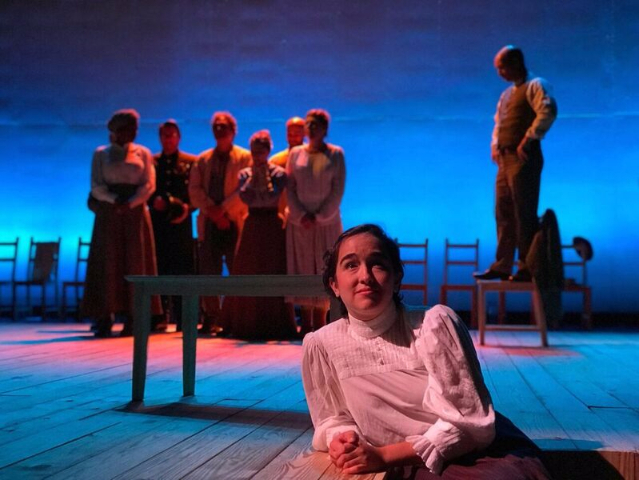 Our Town continues through Nov. 19 at Miami Beach’s Colony Theatre, 1040 Lincoln Road. Tickets, except for the opening night price of $100, range from $45-$65. For tickets and showtimes, visit www.colonymb.org or call (800) 211-1414.